Blade construction: Shinogi-zukuri, Iori-mune katana. Kasane on base is thick. Mihaba is wide standing firmly on base. There is less tapering from base to point holding center-pointed deep curvature leading to an extended middle Kissaki. 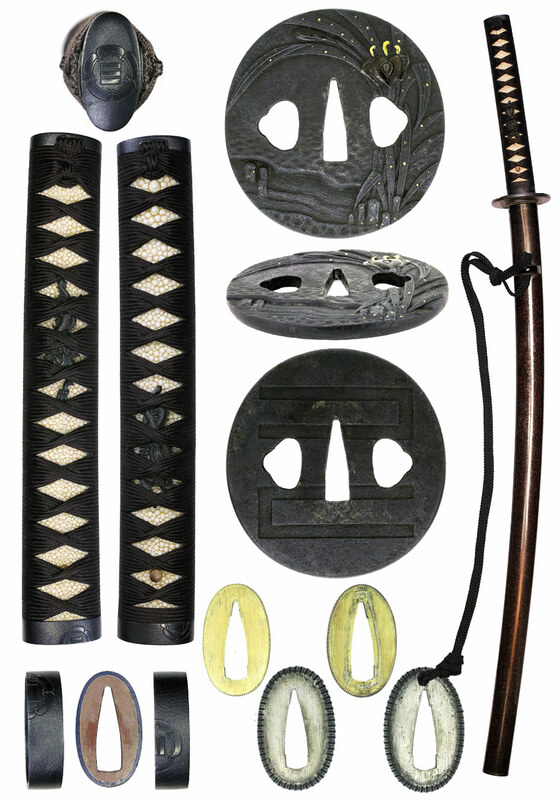 This magnificent katana shows the fashion of the time which flourished during Joukyo to Houei (1684-1710) era. Forging (Hada): Forging mark shows fine Itame wooden marks mixing with some indication of partial Mokume burl ware. Steel gives off the impression of Nie sparkling hard metal granules "Ji-nie" and darkish precise lines of Nie so called "CHIKEI" activity wells out from steel. Temper (Hamon): Hamon is fine but a bit on coarse side Nie hard metal granules base, starts with uphill Osaka-style Yakidashi on base, flamboyant Ō-midare which is composed of large or tall Gunome and box-shape to generates the billows of "Touran-midare". Sparkling Nie granules accumulate on boundary line thickly. The interior of temper is filled with mist-like crystallized area deeply and thick Nie feet splashes into the cutting edge and there works with short lines of Nie so called "Sunagashi"that appears mostly in the head of boundary line. Those activities of quench state are extremely vivid and bright, standing out strikingly. Temper of tip (Boshi): Temper of boshi forms straight of "Suguha" and medium circle turns back deeply. Tang (Nakago): The heel of Nakago is UBU original with one retaining peg hole. Greatly slanting left (O-sujikai) with Horizontal Kesho filemarks and the back ridge of Nagago is a bit round with O-sujikai filemarks. The large, deep and freely chiselled inscription on Shinogi-ji ridge starts with the tile of Mutsu-no-kami 陸奥守, name of clan Tachibana 橘 and smith name TERUMASA 輝政. 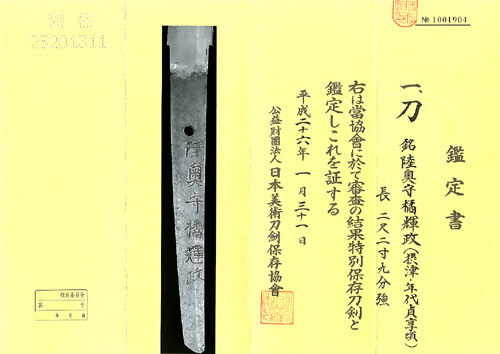 This is a typical katana of Osaka shinto school by the famed smith TERUMASA 輝政 with the title of Mutsu-no-kami 陸奥守 who was an adopted son of the first generation Kobayashi Ise-no-kami KUNITERU 小林伊勢守国輝 in Osaka. Real name is Kobayashi Goro-uemon 小林五郎右衛門. He succeeded the head family of KUNITERU 国輝 on about Genroku (1688-) era and changed to the title of Izumi-no-kami 和泉守 while he moved from Osaka to Matsuyama city, Iyo province (today Ehime pref. on Shikoku) to serve for Uwajima feudal domain. 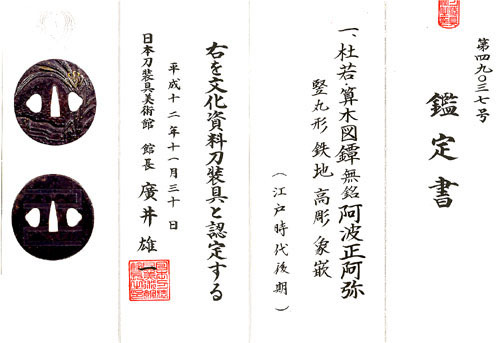 The subject sword was made in his early age while he stayed in Settsu, Osaka during Jyokyo era (1684-87). The whole hamon is the billows of "Touran-midare" that was founded by Tsuda-echizen-no-kami SUKEHIRO 津田越前守助広 and flourished not only among TERUMASA 輝政 or Oumi-no-kami SUKENAO 近江守助直 in the same school, but also spreaded to the other schools in Osaka such as Ikkan-shi TADATSUNA 一竿子忠綱 or Echigo-no-kami KANESADA 越後守包貞. Also this innovative "Touran-midare" had a strong influence to the future generations such as Suishinshi MASAHIDE 水心子正秀, Chounsai TSUNATOSHI 長運齋綱俊, Kato TSUNATOSHI 加藤綱英 or borther TSUNATOSHI 綱俊.